For ten years and 65 instruments, Raven J. Ravary has been refining his craft on the slopes of Haleakala, the dominant volcano on the Island of Maui. Building in high humidity is not advisable, so we are not down near the Ocean, but at 1,700 ft. above sea level in a desert community littered with Cactus of many types. It's a small shop, with only the basic tools any Finish Carpenter would expect to need, and of course, the woodpile of well seasoned instrument grade wood. With an average humidity of nearly 50%, it's a perfect environment to build in. Some day... the dream of building instruments full time may come true, but for now, it's an all consuming Hobby. In 2016, Raven himself made 11 new instruments, and we gave lessons to 13 people who chose to make their own... a pretty busy year. Still, "he can't quit his day job." 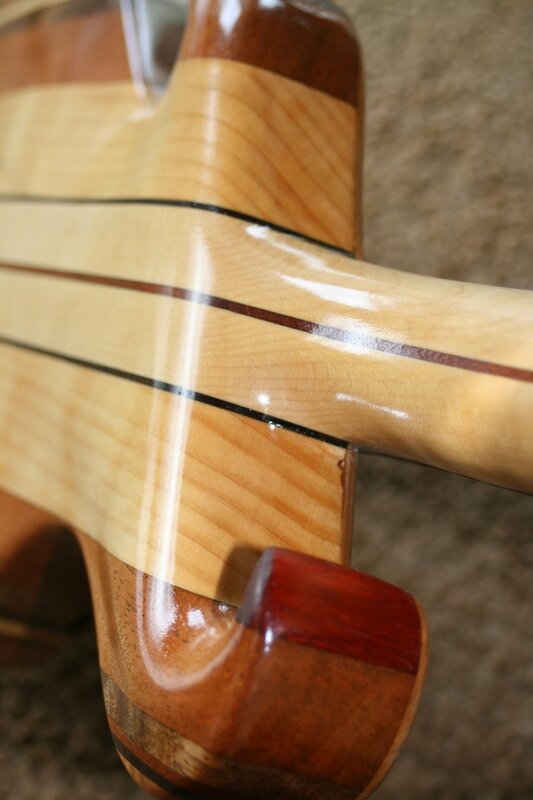 " It's a lot of fun to teach the ordinary person the many steps of Lutherie, and quite a challenge, too... they get to walk away with their own uke for a very reasonable price." 'Class ukes' are flat tops. Typical class schedules are 2hr. classes on Tues. and Thurs. evenings for eight weeks... all efforts are made to 'get 'em done' before graduation day. Still, some have to return later to finish up with the details. "In my hobby, there are endless details." We have made dozens of archtop ukes, an Electric uke or two, quite a few flat tops, several Archtop Guitars, and F- Style Mandolins. Many styles and a wide variety of woods are used. Some builders make the same model every time... maybe that works for them. Here on Haleakala, Variety Is The Spice of Life! 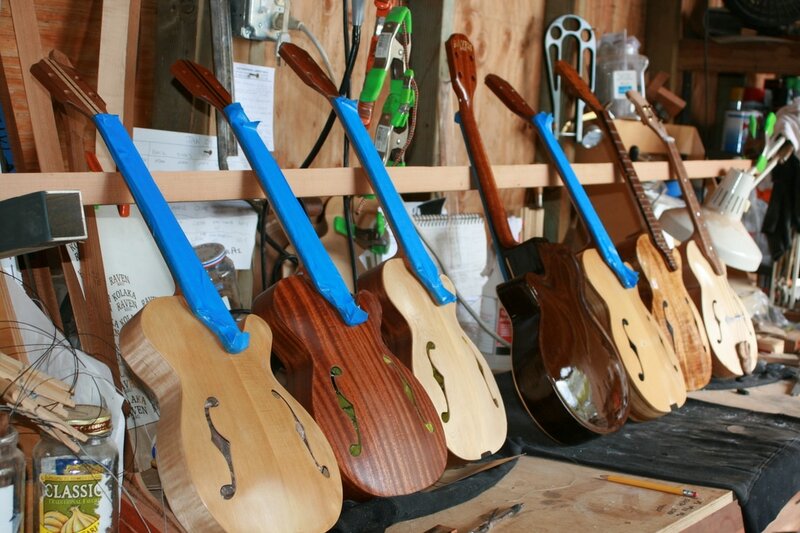 Raven Speaks: " Archtop Guitars have been around since 1875, at least. Archtop Ukuleles never really caught on... Lately you see more, but they are only a small fraction of the total. 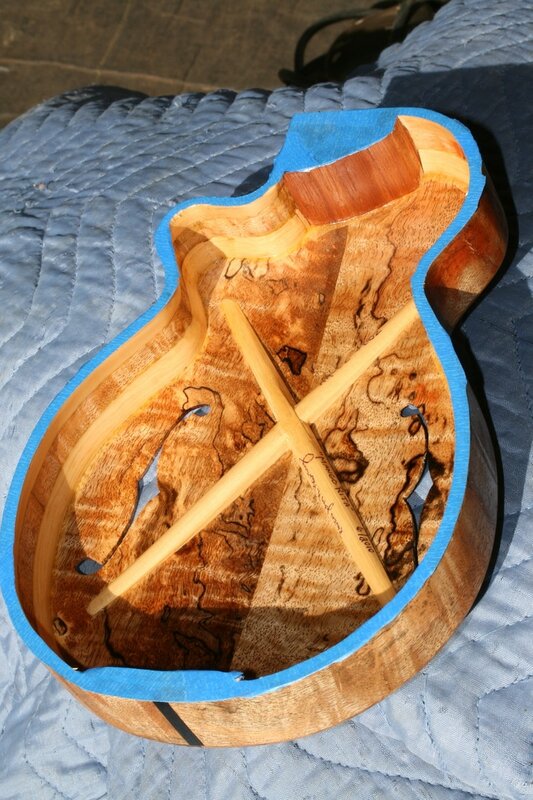 Odd that most uke builders build an arch into their ukes both top and back, but don't care to go the extra work that a true archtop requires. Can't blame them. A curved surface is superior in many ways... stronger, resistant to deformities, so it can be lighter, and it eliminates 'dead spots' where sound is trapped in corners. 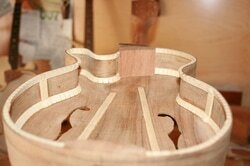 It also takes less material to make a (thin) flat top uke, much less time, and mating the neck is easier. Sometimes I feel a need to defend my pricing structure, so I bring up these points... I have found however that there are many fine ukuleles available for twice the price of my archtops, often in the 6-$8,000 range, and some even higher. My friend who is the director of a fine Art Gallery at one of our best hotels on Maui recently visited a high end Gallery in Toronto. He claimed that the ukes there were three times as expensive and half as good looking ( as mine). It warmed me right up. Thanks, Michael. I am often asked about my tools and techniques, especially with carving the Top and Back Plates. I rough them out as best I can with Robert Bennedetto's quote in my mind- "basic stock removal is not glamorous". Truth is, a simple metal scraper is my primary tool. Hour after hour I firmly scrape away at the interior or exterior of my plates, slowly working them down to the flexibility and feel that I am looking for. It's very tedious and time consuming. It is the only way to get to know that particular piece of wood. No, you cannot simply mill it to a certain thickness! Each Plate has it's own personality and strengths...I have to make it a bit extra thick just in case this one is wimpy, then flex it, and take some more off; after a few rounds of that, fine tuning begins. Two days later and a big pile of shavings... one plate is done! Most builders have turned to 'modern methods', using computers and robots to do the carving, CNC. Or, they run a top through the thickness sander to maybe .080 inches, and glue some braces on.... In this age, that's about the only way to build enough ukes to gain a market share and compete. I can't compete with the mass production, nor do I care to. I fill them full of Love, and hope you can tell the difference.